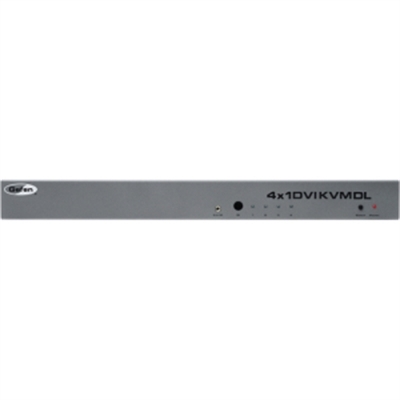 Gefen's 4x1 DVI KVM DL Switcher provides you with greater flexibility in integrating cross-platform computer equipment easily and without networking. It enables you to switch easily and reliably between any combination of four dual link or single link DVI computers using one dual link DVI-compliant display. The 4x1 DVIKVM DL Switcher supports USB 2.0 for USB keyboard/mouse and other high-speed peripherals. Audio is switched for each computer as well, allowing for the creation of multimedia desktop environments, and you can even choose between a Macintosh or PC keyboard/video/mouse combination. Switching can be controlled through the included IR remote, the front panel source selector button, or the built-in serial port using RS-232 serial communications.